If ZEGO bars are free from the top allergens, why bother testing each batch for cross contact? Like all allergy-friendly companies, we carefully source our ingredients, don’t bring common allergens into the manufacturing facility, and train our staff on allergy safety but we don’t feel that is enough precaution. The most likely place cross contact would happen for allergy-friendly companies is in the field and processing plant for your raw ingredients, before they ever get to your factory. For example, we’ve had pumpkin seeds delivered to us that had spelt (wheat) sprinkled in with them, which most likely happened at harvest. The cost would be too prohibitive to test every container of ingredients, so companies spot test here and there, so some cross contact could not be detected. By adding in a final test at the end of the batch, we can find out if any cross contact slipped through the system regardless of our other precautions. Because we believe in 100% transparency, provide you access to the reports through the QR code on each ZEGO package. We think every company should be testing and publishing the results as well. If you agree, start contacting your favorite companies, and ask them to provide this level of transparency. I’d like to learn more about your glyphosate testing. Can you guarantee my ZEGO products will never have glyphosate in them? You can read all about our testing on our Food Safety page. You may know that glyphosate is in our rain, water systems and soil, even contaminating organic farms. Glyphosate testing is a new test, and our first tests showed our products to have no measurable amount of the residue. We do not have long term testing data to show whether we should expect that result every time, so we cannot guarantee the tests will always have the same result. For example, if there has been a lot of rain, it’s possible the tests could measure some residual amount. The tests are expensive so we cannot test every batch, but we plan on testing at least twice a year. We pledge to you that we will monitor and test for glyphosate and continually work to minimize any amount in our products. Feel free to contact us at info@zegosnacks.com if you would like more information. I am DIABETIC or Pre-Diabetic, what ZEGO snacks would you suggest? Here are some ideas based on common recommendations for diabetic snacks. I have a gut autoimmune disease. What ZEGO snacks are better choices for me? Are ZEGO products only for people with food allergies? No. In fact, many of our ZEGO fans actually do not have food allergies! They love ZEGO for its convenience, purity, flavor and nutrition. Is there sunflower in all your recipes? Yes, they are an ingredient in our Seed+Fruit Bars and Mix-Ins products. With our Just Fruit Bars and Fruit+Chia Bars, we use organic sunflower oil on the conveyor belt that carries the bars so they won’t stick. What is sorghum syrup and why do you use it? Sorghum syrup is made from the stalk of the sorghum plant; it is less processed than many other sweeteners and has the lowest fructose content of all the syrups. It does not have the arsenic contamination problem that rice syrup has. We use it in our organic Seed+Fruit bars for several reasons. The first is that we need something to hold the bars together and syrups are great at that. We could use only dates, but when we tried that, the bars were too sweet and all you could taste was dates. So to keep our sugars down and improve the flavor balance, we use a blend of dates and sorghum syrup in our Seed+Fruit bars. If you prefer a snack with no sweetener added, try our Just Fruit and Fruit+Chia bars. What is sacha inchi seed? Do people have allergies to it? Sacha inchi is a seed grown in Peru. It was once planted around ancient cities to provide nourishment. Prized for its protein and omega 3 (ALA) fats, these seed are so high in Omega 3s that they actually taste and smell like fish! In fact, they have 17 times more omega 3s than sockeye salmon. This large seed is legendary for its many health benefits. Realizing the market for fish-tasting nutrition bars is indeed small, we do not use the oil in ZEGO’s Seed+Fruit bars. We crush the seeds to press out the oils and then lightly roast the crushed seeds. e use the resulting powder to add protein to our bars. Sacha inchi protein is considered to have the highest quality protein of any other plant-based powders on the market. All the other protein powders are derived from their source using chemicals or enzymes. This can make them hard to digest. But, because sacha inchi protein is just crushed and roasted, and not a derivative, it is easy on your stomach. People can have food allergies to virtually any food, so it is possible to have an allergy to sacha inchi seeds. They are fairly new to the U.S., so we do not have allergy data on them at this point. If you have a seed allergy, check with your doctor. “If you walk into an orchard, pick an apple from a tree, rub that apple on your shirt, you’d notice that it shines, and that’s because you’ve just polished off the natural waxes and also yeasts that the apple produces in order to protect its high water content. And without that wax, fruits and vegetables would end up going all dry and nasty. After they’ve been harvested, apples get washed and brushed to remove leaves and field dirt, and then they get packed in cartons for shopping to your market. This process removes some of the fruits original wax coating that actually protects the fruit. Are your ZEGO products Organic / Non GMO? Our Seed+Fruit bars and Mix-Ins are certified organic, and our Just Fruit / Fruit+Chia bars are certified Non GMO. The original farmers who started the Gorge Delights company that created our delicious Just Fruit bars grow delicious apples and pears along the Columbia River in Oregon and Washington. At ZEGO, we are committed to continuing that tradition of sourcing our fruit from co-op farms that region (and our strawberries are from California). We believe where our fruit is grown is the secret to the amazing fresh fruit flavor of these bars. We would love to use only organic fruit but only 1% of US farmland is organic. And, much of the organic fruit is sold as whole fruit at market and not available in the quantity we need year round. So, we would have to purchase organic fruit from overseas to supplement what we could get from the US. But, we are concerned about high pesticide residue in organic fruit grown in China and some Central and South American countries. To assure our products are as clean as possible, we go through the non-GMO verification process and actually test them for pesticide residue, specifically for the glyphosate chemical found in Round Up. Because the farmers in Oregon and Washington do not typically use Round Up due to their climate and topography, our tests show that the pesticide residue levels in our fruit bars are nearly as low as that you would expect to see in organic fruit. Yes! No animal products are used in ZEGO products. Are ZEGO products certified Kosher? Yes! All ZEGO products are certified Kosher. Are ZEGO products certified Gluten-Free? Yes! All ZEGO products are certified and tested Gluten-Free. Do ZEGO products contain any artificial colors or dyes? NO! Rest assured no natural or artificial flavorings, colors, or dyes are used in any of our products. Will ZEGO products fit into my Paleo or Whole30 diet? All of the Just Fruit and Fruit+Chia bars and Apple Cinnamon Mix-Ins fit into the Paleo and Whole30 diets. They are made from 100% fruit and Chia seeds – that is it! No grains, nuts, soy, flavorings, extracts, legumes, preservatives, or added sugars are in these bars. Our organic Seed+Fruit Bars and Chocolate Chip and Cranberry Mix-Ins are not technically Whole30 approved but we would call them Whole 30 friendly. Are ZEGO bars low glycemic? Yes! They are great snack if you are watching your blood sugars, particularly the Just Fruit Bar Pear, Strawberry and Blueberry along with all the Fruit+Chia Bars, Seed+Fruit Bars and Mix-Ins. Are ZEGO bars certified R.A.W.? No, all of our products contain one or more ingredients that have been heated above 104 degrees. Our Mix-ins are mostly raw except for the cranberries, chocolate chips and apples. Are ZEGO bars a meal replacement? No, ZEGO products are designed to be a nutritious and tasty snack or, with Mix-ins, an add on to improve the flavor, crunch and nutrition your meal. Are ZEGO bars good for athletes? Yes! Many of our ZEGO fans actually don’t even have food allergies, but because they are so easy to digest, and have great taste and nutrition, they are great snacks to have pre, mid, or even after a tough workout. Check out our blogpost Why I Run with ZEGO to see why we’re loved by runners. I saw that ZEGO tests for Glyphosates – what does that mean? Glyphosate is the main ingredient found in Round-Up. And you might be wondering why we would test for this if we are already certified Organic / Non GMO. Well, because Round-Up is so widely used around the world, it’s found everywhere – even in our drinking water! This means that even organic farms can have Glyphosate residue from the rainwater, or from runoffs from a nearby farm. Glyphosate is proven to be detrimental to our health, and we want to raise awareness on this issue. Buying organic just isn’t enough, and we need your help! If we start demanding that companies test for this residue, we will see a real change in the food industry. The side effects of Glyphosate are very similar to Celiac Disease. So, it’s possible that if we reduce the use of glyphosates and clean up our food system, we will see fewer and fewer people with these food allergy symptoms. The Glyphosate problem is why we source our fruit entirely from the Pacific Northwest. Because they face colder winters, everything freezes, which helps kill off the weeds. As a result, most farms (even non organic farms) don’t need to use Round-Up, which means there is less residue in the rainwater in the Pacific Northwest, and organic farms don’t have to worry about the runoff from non organic farms. What is a processing aid, and why do you use one? A processing aid is a food used to aid production. It is not an ingredient in the recipe and it is not required by law to be disclosed, (only trace amounts, if any, end up in the finished product), which is why you won’t normally see aids listed on an ingredient list. 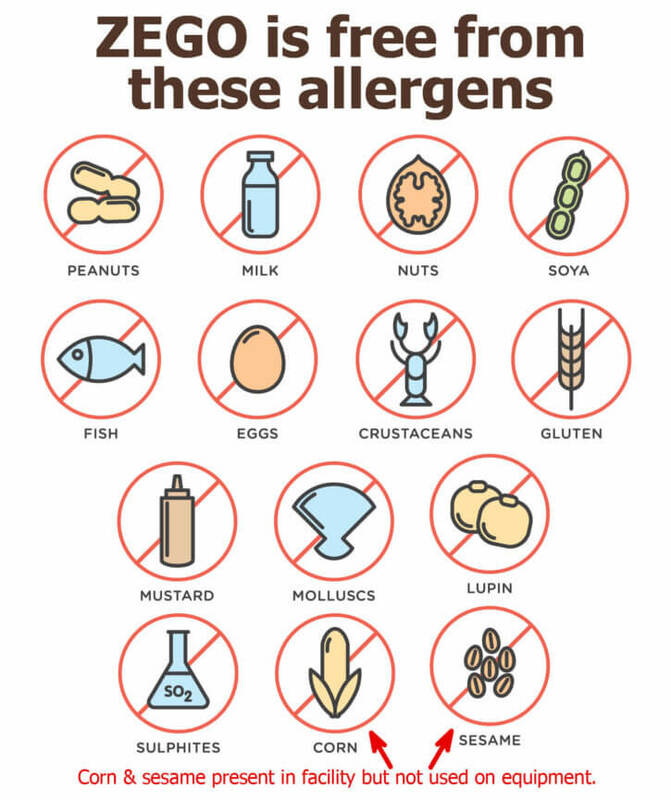 However, because we believe in complete transparency and want people with allergies to be safe, we include this on our packaging. We use Organic Sunflower Oil as our processing aid when making our bars – it helps them run smoothly down the line, preventing them from sticking to the machine. What exactly is fruit concentrate? Fruit concentrate is made by extracting the water from the fruit juice – what is left after the water has been removed is fruit concentrate. The fruit concentrate we use has no added ingredients or preservatives, it is 100% fruit. Where does ZEGO source the fruit? We carefully source our fruit from family farms in Washington, Oregon, and California. Additionally, we use the farms “ugly” fruit to help cut down on waste. What is ugly fruit? It is fruit that is perfectly good to eat, but is misshapen and won’t sell in grocery stores. Will ZEGO come out with more products? Yes!! We are working on some exciting new products right now! Keep an eye out for new products coming in early 2019. I don’t live in the US, can I still order ZEGO bars? Yes–as long as you initiate the order from outside the U.S., you can order and have your product shipped to Canada and 12 other countries. Subscriptions are supersized with 3 extra bars/box! So, a subscription of Seed+Fruit bars has 12 bars and the Just Fruit/Fruit+Chia bars have 15 bars per box. I’m confused by the subscription. What is it and why is it a better deal? Our subscriptions come supersized! For the same price of one, regular box, you will receive 3 extra bars. You can chose the frequency of delivery (once a month, every other month, or every 3 months). You can cancel or place it on hold at any time. Just email us, and we’ll help you make any changes to your subscription – no questions asked. The Seed + Fruit subscriptions have 12 bars instead of 9, and the Just Fruit & Fruit + Chia subscriptions have 15 bars instead of 12. It’s a great value! Can I customize my box to include my own assortment of bars? Not yet. We do have mixed boxes available of each type of bar along with a 12 bar variety pack, which has 1 bar of each flavor. I’ve never tried ZEGO bars – can I get a free sample? Unfortunately, we can’t give away free samples; however, we have some great sample packs available on our website. Our 12 bar variety pack is our favorite to recommend because it has 1 bar of every ZEGO flavor. And, for your first order, you can get 15% off with our pop up coupon. I want my local store to carry ZEGO! What can I do? Ask the manager to carry us! Stores love hearing what thier customers what. Where can I buy ZEGO bars in my area? Check out our Store Locator Page to see which stores near you carry ZEGO! I would like to sell ZEGO bars at my business, do you have wholesale pricing? Yes, we do! Please click here to learn more about our wholesale program. We also run sales and giveaways on social media – so follow along with us. What happened to Gorge Delights? Don’t worry, we kept the same ingredients, recipes, and even machinery that Gorge Delight used to make the old bars. Read Colleen’s letter, which explains all the changes and our relationship to Gorge Delights. Is ZEGO a B Corp? What does that mean? Yes we are proud to be a B Corp, which certifies that we are actively using our company to bring social and environmental good to our world. Please read visit our B Corp profile find out more about our work to improve food safety and transparency and improve nutrition for children. I try to buy from responsible companies, what does ZEGO do to give back and/or help the environment? We are so glad you asked! We love giving back too. In addition to being a B Corp and to our monetary donations, we donated over 10,000 bars to help the hurricane survivors and the Northern CA fire victims this past year. But that’s not all we do! Check out our blogpost on Why We are a B Corp for more info. How can I connect with ZEGO on social media? I have a more specific question. Who can I reach out to? Didn’t find the answer you were looking for in our FAQs? No problem, you can reach us at info@zegosnacks.com. Either Colleen or Danielle will get back to you right away.